To create a community facility within Wandsworth, to reduce mental health inequality and to enhance mental health justice. With further aims to address the needs of further areas across London. MH Hub has a vision to support the local community of Wandsworth with the establishment of a multi-use community hub facility for people who suffer from mental illnesses. The Hub will provide services working to help both older and younger people, share experiences, skills, knowledge and support, whilst spreading the our vision across South London. Our approach will help ensure that the Hub’s Vision, to directly focus on the needs of the community it serves and that the services being provided remain relevant and can be adapted to suit any changes in the environment. The reality is we clearly have a variety of current and future community needs that stretch across the Wandsworth Borough and Greater London. We believe, that our presence can, and will empower people in the community, bring our community closer together for the overall betterment of mentallly ill people of all ages. The costs to the NHS in England have been described in a report by the London School of Economics. 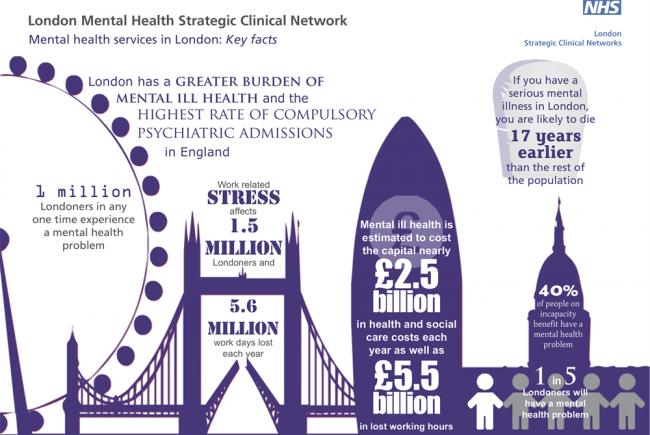 Total expenditure on healthcare for mental illness amounted to some £14 billion/year (2010/11). Poor mental health is associated with physical health problems. Of those with a long-term physical health condition around 30% will also have a mental health problem, and of those with a mental health problem, around 45% will also have a long-term physical health condition. The MH Hub recognises that all of these are core arguments, and these have in fact driven the establishment of the MH Hub organisation and the ultimate provision of the facility, through support for all people who suffer from Mental Health in the community. It is intended that the facility will play a long-term key role in breaking into these influences and experiences, thus reducing the effects of loneliness, isolation, social injustice and, therefore health inequalities. As a charity, we are aware that the environment and the context in which we work and live in is changing rapidly and indeed has become much more challenging to organisations which provide services for minorities in deprived communities and on behalf of mentally ill citizens. MH Hub needs a grant of £600,000 to purchase and develop a community hub building which would become a larger community use facility. The hub will benefit the community and greatly enhance the facilities within the community. It will include a large main room for socialising/activities and smaller rooms for sessions and meetings, an outdoor sports area, a cafe, storage and management facilities for the community foodbank, teaching and learning facilities and high standard IT facilities. The building will provide an interactive sociable haven and will accommodate a range of Community Hub facilities. We look to actively encourage mentally ill members of the community to use these facilities which will be staffed and operated by MH Hub with oversight Management through a Board of Trustees. The flexibility in design will allow the building to be extended in the future. We have identified an area of land in tooting that is available with planning approval for first floor developments. This is an ideal location for the Hub; as it is local to the Springfield Mental Health Hospital in Tooting. The selling price of this building is £4000,000. In developing our plans, this model has been agreed as a positive basis on which to further shape the plans for future hubs across London. Project Delivery Manager: MH Hub The Project Delivery Manager takes legal responsibility for receiving and spending the funds raised and ensuring the project is delivered.